Getting Published–and Not Even Knowing It! It’s an odd experience to get published and not know it. I suppose I should be glad, but it wasn’t something I ever submitted, nor did I write it for publication. Over Christmas I was visiting with family in Corry, a small town in western Pennsylvania. My sister happens to be quite the photographer and recently had two of her large photographs on display at the Painted Finch Gallery in Corry (displayed, that is, until both sold at a juried art show!). Anyway, several of us made a stop in at the gallery on Christmas eve. The gallery is an eclectic mix of wildlife oil paintings, flowers and scenery in watercolors, color and black-and-white photography, pottery, jewelry, and work in other types of mediums that I, as a non-artsy person, can’t name but can appreciate. While the others chatted with the proprietors, I wandered. In the back, near a glass case holding jewelry and pens, was a small holder with some greeting cards and a couple of paperback books. Of course, I picked up the books. One was a little paperback history of the town of Wattsburg, Pennsylvania. 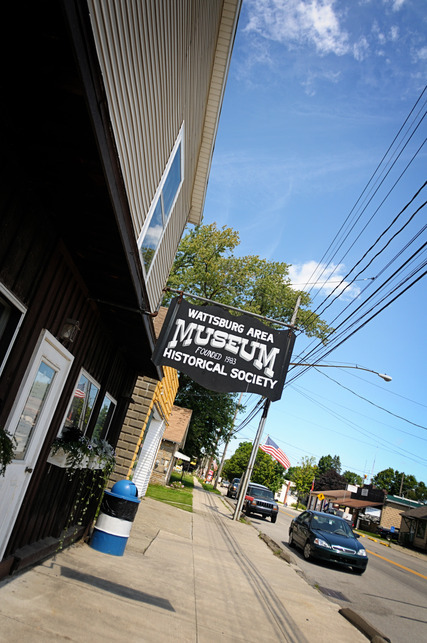 The little borough of Wattsburg, nestled about fourteen miles northwest of Corry, happens to have been my dad’s hometown. My grandfather had lived there most of his life–even was the mail carrier for many years (I talked about that in this post). We visited nearly every summer with him and cousins who lived nearby. Many years passed and, either in high school or college, I wrote an essay about the fair and grandpa. Later, I mailed it to him, thinking he would enjoy my reflections. He passed away not many years later. So at the art gallery, I thumbed through the book about Wattsburg’s history filled with quirky stories, anecdotes, and people’s memories. I went to the spine and copyright page (hey, I’m in publishing–it’s a habit) and saw that it was self-published. The introduction stated that the material in the book had been gleaned from the Wattsburg Historical Society. Flipping pages revealed an index in the back. I wonder if gramps is in here, I thought. Chaffee, Chaffee–there he was! And, to my surprise, so was I. Page 49. What’s on page 49? And there, to my astonishment, was my little essay about gramps and the Wattsburg fair. I’m guessing that gramps received my essay in the mail and stored it among his fair papers, most of which apparently ended up in the historical society. The editors of this collection must have discovered the typewritten pages (or maybe they were handwritten, I can’t remember) among the papers and decided to publish it in this collection. It’s a little embarrassing to read the musings of my early life (not to mention my immature writing style) from so many years ago. In the midst of my article, the editors had put a black-and-white photo of the fair committee, and among them is my dear grandfather. So as odd as it is to be published without knowing it, I suppose for the audience of this particular book (one being my dad, who received that book the next day as a Christmas present), my little essay might bring back some good memories. If my writing can do that, I suppose that’s all I can ask. Wow. And nobody told you??? Amazing!! God must have led you to look at that book. Way cool. 🙂 Have you contacted the Historical Society yet?